The Loire ConneXion Strikes Again! Once again, we were in the Loire on the first Friday of the month so were able to attend the Loire ConneXion’s monthly get-together organised by Summer Jauneaud. 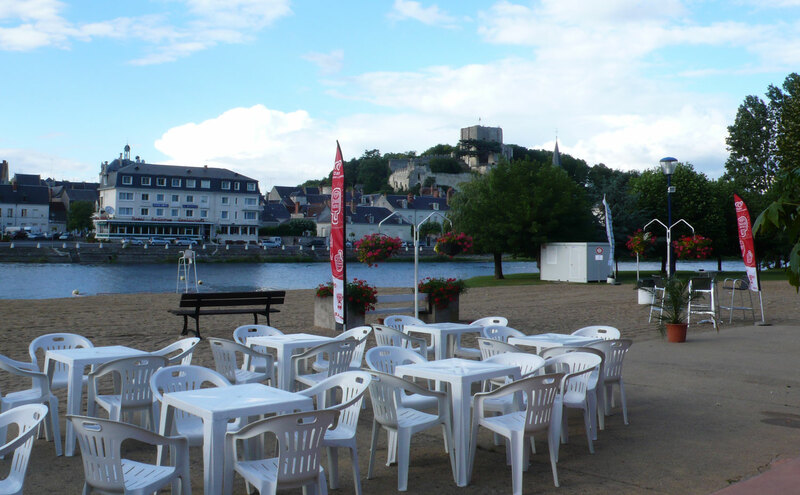 The last two times, it’s been at The Shaker in Amboise with its exceptional view of the Loire and Amboise castle. This time, it was in Montrichard, an historical town in Sologne just 5 minutes from Chenonceau, built on a hill next to the Cher River, its keep looming majestically above, which so far we’d only seen in the winter when we went to stay at Yvonne David’s wonderful B&B, Le Moulin du Mesnil. Yvonne’s son Jason, who’s a chef, has just opened a restaurant there called “La Plage”, (the beach), which seemed a little strange to me because the sea is a long way away. But it really does look like a beach and this year, swimming in the river is even allowed. There had been intermittent rain all day but the evening turned out to be fine. 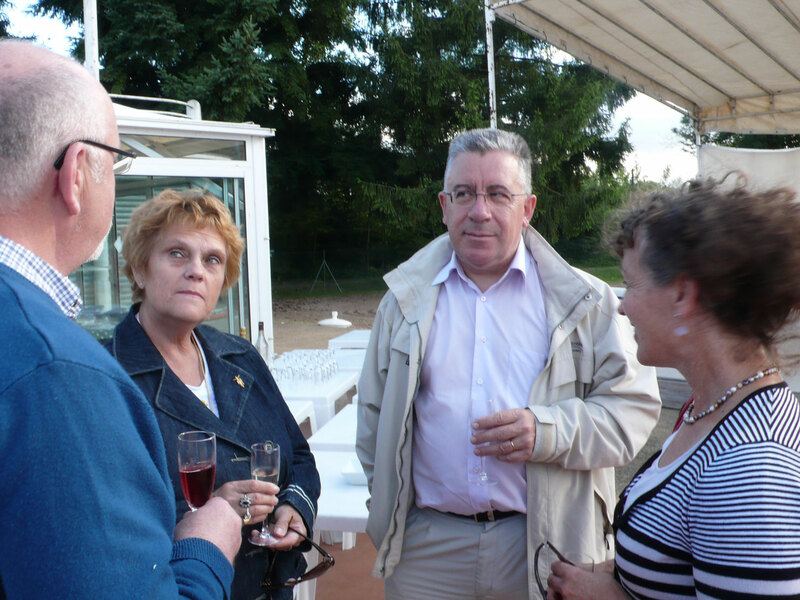 We were able to enjoy our tapas and local sparkling wine (crémant) outside on the terrace with our new neighbours Françoise and Paul and about 40 other English speakers and anglophiles, some of whom I’d already met at other events. Unfortunately, I didn’t check first to see if the chairs were dry before sitting down! We ate our meal inside and then went outsideagain for dessert and coffee so that we could change groups and mingle. It’s very interesting to hear how people end up living in France. There’s a real mixture of people like me who have been here for many years (though I pretty much hold the record with 37 years!) and others who came to France because of their spouses or jobs or decided to retire in the Loire for other reasons. Not all speak fluent French. Next month, we’ll be meeting on the second Friday of the month at Summer’s to attend a production in English written and performed by some of the members’ offspring. Should be a very interesting evening. 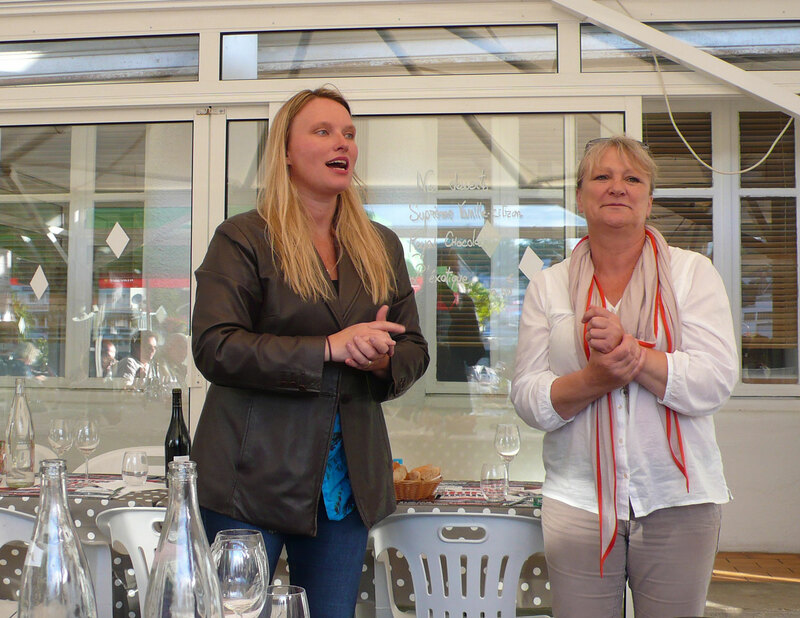 If you’re interested in the Loire ConneXion and you’re on Facebook, become my friend (Fraussie Grouet) and I’ll invite you to join the community. If you’re not an FB user, just send me an email and I’ll put you in contact with Summer. And in the meantime, drop in to La Plage for lunch when you’re visiting Chenonceau or watch the sun set over the river in the evening. Jason speaks English, of course! And Yvonne might be giving a help hand as well. La Plage, 2 rue de la Plage, 41400 Faverolles sur Cher. 02 54 32 66 08. Open every day. Café, restaurant, ice-cream vendor. This entry was posted in Lifestyle, Loire Valley, Restaurants. Bookmark the permalink. 8 Responses to The Loire ConneXion Strikes Again! I live in Amboise. Because I cannot speak French I am very isolated. I need to meet English speaking locals. Does the Loire Connexion still meet at Le Shaker? Do I have to join? Or do I just go along? If so when are the Meet Ups? Hi Pamela, I’ve sent you an email and asked to have your name added to the Loire Connexion list. Please let me know if you don’t receive my email.